WHAT: The University of Illinois Springfield Center for State Policy and Leadership will host “Building Our Children’s Futures: A Multi-Disciplinary Conference to Address and Confront Child Poverty”. The two-day conference will present and discuss the latest research on the damaging effects of poverty on child well-being and ways to stop the trend. About one in five children in Illinois —more than 600,000—live in poverty. DETAILS: The conference aims to bridge research, application and practice by bringing K-12 teachers, healthcare, mental health, law enforcement, early childhood and social service professionals together with scholars, practitioners, policymakers, service providers and activists in the fields of neuroscience, pediatric medicine, mental health, education, law enforcement and social service to explore the current research on the damaging effects of poverty on child outcomes, intervention programs and strategies that work and the public policy implications on the damaging effects of poverty on children. Keynote speakers include Diana Rauner, Ph.D., president of Ounce of Prevention; Benard Dreyer, M.D., FAAP President, American Academy of Pediatric; and Bryan Samuels, executive director of Chapin Hall at the University of Chicago. The conference is presented in collaboration with the Illinois Association of Community Action Agencies, the Illinois Head Start Association, the United Way of Central Illinois Ventures Grant, Springfield School District 186, Southern Illinois University School of Medicine, the Illinois Education Association, The Paul Simon Public Policy Institute at Southern Illinois University, The Land of Lincoln Community Foundation Women for Women’s Fund and Hospital Sisters Health System of St. John’s Hospital. The registration fee for the conference is $300. Participants can register online at http://blogs.uis.edu/ChildreninPoverty/. For more information, contact Lorena Johnson at 217/206-6079 or ljohn04s@uis.edu. WHAT: The University of Illinois Springfield Engaged Citizenship Common Experience (ECCE) Speaker Series presents a screening and discussion of the documentary film “The Propaganda Game” by Álvaro Longoria. 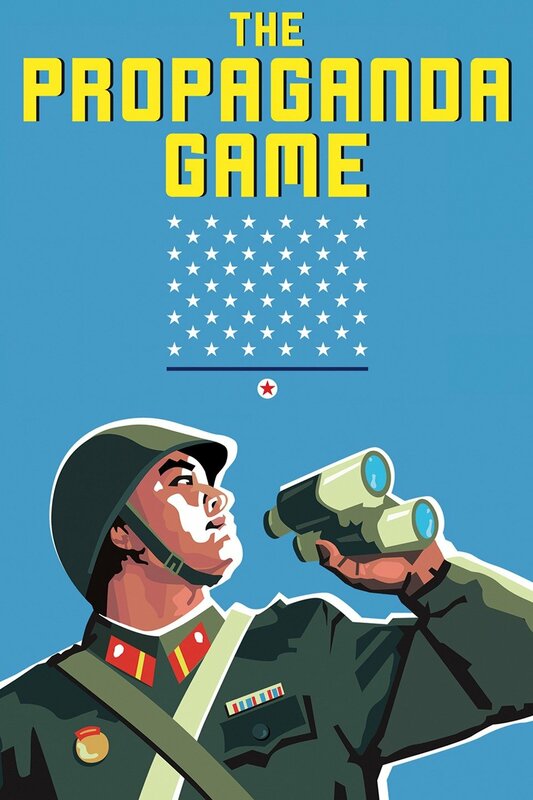 The film explores how propaganda functions inside and outside of North Korea. WHEN: Monday, February 6, 2017, at 6 p.m. DETAILS: Longoria was allowed to film within North Korea, although his visit was monitored by a Spanish sympathizer for the North Korean government who himself becomes a subject of the documentary. The film includes interviews as well as archival and contemporary news footage as it attempts to describe the nation’s social and political realities with attention to media manipulation by and against the government of North Korea. The ECCE Speaker Series will screen and discuss the film, confronting basic and important questions about how people around the world acquire political knowledge of places and events they’ve never experienced. The discussion following the screening will be moderated by Richard Gilman-Opalsky, UIS associate professor and chair of political science. He is the founder of Political Art and the Public Sphere (PAPS). The idea behind PAPS is to consider how “political art” raises provocative social and political questions, and to engage in discussion with students, faculty, and members of the general public. WHAT: The University of Illinois Springfield English Department and the College of Liberal Arts and Sciences present “Winter Dreams”. The evening will include original poetry read by members of Springfield Poets and Writers, live classical music by Blackwater String Ensemble, a cash bar and complimentary hors d’oevres. The event is open to the public. WHEN: Thursday, February 2, 2017, from 7 to 9 p.m. DETAILS: In conjunction with Springfield Poets and Writers and the Blackwater String Ensemble, the UIS English Department has created this event both as a fundraiser for graduate students in their newly designed master’s in English program and in an effort to foster a more connected relationship between cultural and fine arts communities in the Springfield area. A suggested donation of $12 ($6 for current UIS students) will help to fund graduate students’ professional development, including attending conferences and literary festivals and performing research. In the fall of 2015, the UIS English Department launched its redesigned master’s degree program. Its curriculum was re-created to better prepare students for the digital and technologically-based aspects of positions in teaching, writing, and publishing. The proceeds from “Winter Dreams” will support students in the program’s two tracks—Digital Pedagogy and Digital Publishing. For more information about the UIS English Department, visit the department's website or connect with the department on Facebook. Questions about the event may be directed to UIS English Instructor Gillian Bauer at 217/206-8332 or gbaue2@uis.edu. The University of Illinois Springfield will celebrate Black History Month in February with a variety of events designed to educate and raise awareness. The theme of this year’s celebration is P.O.W.E.R. (Perseverance, Opportunity, Wealth, Education, and Responsibility). The following events are free and open to the public. Students and community members are invited to participate in a Candle Light Vigil honoring the life of anyone who they have lost. Participants are encouraged to light a candle and say a few remarks for that special person. The vigil will start at 10 a.m. in the Sangamon Auditorium Lobby. The UIS Engaged Citizenship Common Experience (ECCE) Speaker Series presents a screening of the Netflix documentary film “13th” by director Ava DuVernay. The screening will be followed by a panel discussion featuring Illinois Innocence Project exoneree Teshome Campbell and other special guests starting at 6 p.m. in Brookens Auditorium, located in the lower level of Brookens Library. Watch UIS students participate/compete in a trivia game to learn about important people, inventions, and legislations that impact the way we see society today. This event will take place at 9 p.m. in the Student Life Building (SLB). Join the night of festivities as UIS celebrates black males on their accomplishment of being inducted into the Black Male Collegiate Society. Hear from various members and newly inducted members on their journey from maleness to manhood. This event starts at 5:30 p.m. in the Public Affairs Center, Conference Rooms C/D. The Soul Food Festival will serve to educate, entertain, and unite participants through performances such as poetry, dance, singing and stepping. Additionally, there will be a variety of Soul Food dishes for participants to enjoy. This event will take place at 7 p.m. in the Student Life Building (SLB) Gym, located on the east side of campus. The UIS Engaged Citizenship Common Experience (ECCE) Speaker Series presents “Black Lives Matter - Through the Prism of Fredrick Douglass”. The panel discussion will explore the Black Lives Matter Movement through the prism of Douglass' “West India Emancipation” speech of 1857. The event starts at 6 p.m. in Brookens Auditorium, located on the lower level of Brookens Library. Come out and enjoy a film that helped transcend American families as we see them today. "Loving" is a 2016 American historical drama film which tells the story of Richard and Mildred Loving, the plaintiffs in the 1967 U.S. Supreme Court decision Loving v. Virginia, which invalidated state laws prohibiting interracial marriage. WHAT: The University of Illinois Springfield Engaged Citizenship Common Experience (ECCE) Speaker Series presents a screening of the Netflix documentary film “13th” by director Ava DuVernay. The Black History Month screening will be followed by a panel discussion featuring Illinois Innocence Project exoneree Teshome Campbell and other special guests. WHEN: Friday, February 3, 2017, at 6 p.m. DETAILS: Centered on race in the United States criminal justice system, the film is titled after the Thirteenth Amendment to the constitution, which outlawed slavery (unless as punishment for a crime). 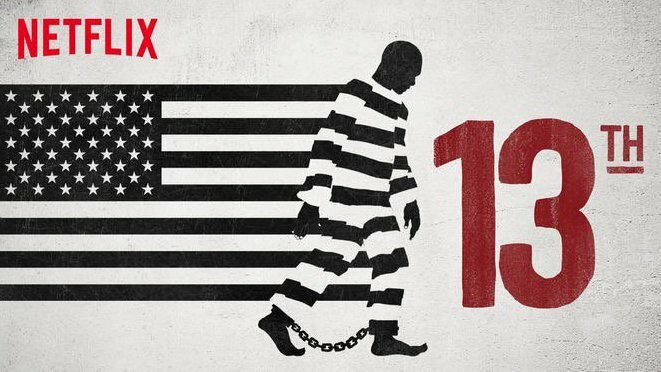 The documentary argues that slavery is being effectively perpetuated through mass incarceration. The filmmaker argues that the criminal justice system has been exploited through a variety of bad legislation measures passed by and supported by many U.S. congress members and U.S. presidents. As a result, many African Americans and other minorities from impoverished environments found themselves in vulnerable positions, mostly commonly landing them in prison after the passing of this legislation. The discussion will be moderated by Kamau Kemayo, UIS associate professor and chair of African-American Studies. Other panelists include Illinois Innocence Project exoneree Teshome Campbell; Larry Golden, UIS emeritus professor and founding director of the Illinois Innocence Project; and Deanie Brown, UIS associate chancellor for access & equal opportunity. This event is co-sponsored by the UIS Diversity Center. For a list of other upcoming ECCE Speaker Series events, visit www.uis.edu/speakerseries/. All events are free and open to the public. UIS Theatre to hold open auditions for upcoming performances of "Almost, Maine"
The theatre program at the University of Illinois Springfield (UIS Theatre) will hold open auditions and crew interviews for their upcoming production of John Cariani's play “Almost, Maine” on Sunday, Jan. 22 and Monday, Jan. 23, in The Studio Theatre at UIS. Crew interviews will begin at 6 p.m., followed by auditions at 7 p.m. both nights. Roles and crew positions are open to students, faculty, staff, and community members. Callbacks are slated for Tuesday, Jan. 24. 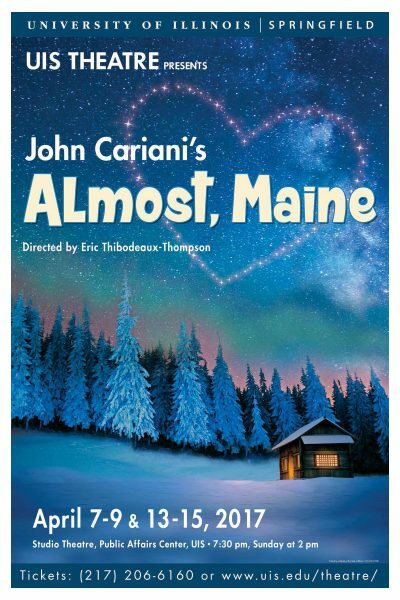 “Almost, Maine” will be performed April 7-9 and 13-15, 2017 in the Studio Theatre, located on the lower level of the Public Affairs Center. UIS Associate Professor of Theatre Eric Thibodeaux-Thompson will direct with scenic design by UIS Assistant Professor of Theatre Dathan Powell. 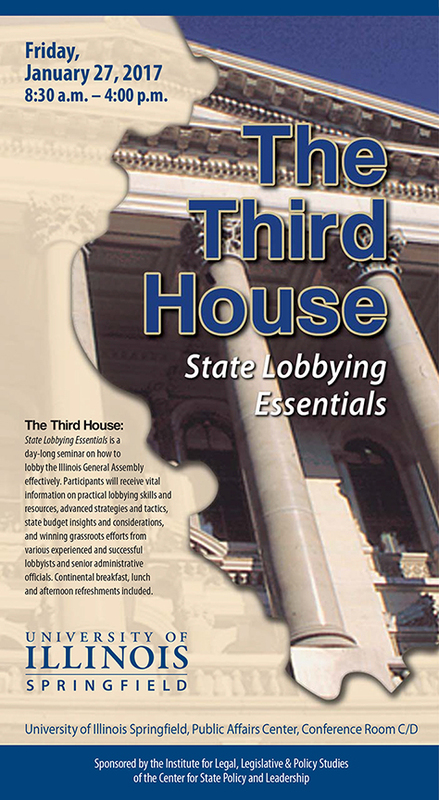 WHAT: The Institute for Legal, Legislative and Policy Studies at the University of Illinois Springfield will host “The Third House: State Lobbying Essentials”, a day-long seminar on how to lobby the Illinois General Assembly effectively. WHEN: Friday, January 27, 2017, from 8:30 a.m. to 4 p.m. DETAILS: Participants will receive vital information on practical lobbying skills and resources, advanced strategies and tactics, state budget insights and considerations and winning grassroots efforts from various experienced and successful lobbyists and senior administrative officials. Featured speakers include: Amy Ballinger-Cole, ABC Consulting; John Lowder, Lowder Governmental Solutions, LLC; Kim Clarke Maisch, Cigna Healthcare; Professor David Merriman, University of Illinois at Chicago; Ashley Munson, Illinois Environmental Council; Courtney Nottage, Fletcher, O’Brien, Kasper & Nottage, P.C. ; Polly Poskin, Illinois Coalition Against Sexual Assault, and Josh Weger, Indiana Illinois Iowa Foundation for Fair Contracting. The registration fee is $300 and covers the cost of attendance, an electronic copy of the publication “Lobbying Illinois: How You Can Make a Difference in Public Policy”, plus a continental breakfast, lunch, and afternoon refreshments. Seating is limited. Register online at www.uis.edu/illaps/the-third-house-state-lobbying-essentials-2017/. The event is open to anyone who registers, but is designed for lobbyists, prospective lobbyists, legislative liaisons, government affairs representatives, members of the media, not-for-profit advocates and executives, state and local government officials and employees and students. For more information, contact the UIS Institute for Legal, Legislative and Policy Studies at 217/206-6364 or illaps-events@uis.edu. Six faculty members from the University of Illinois Springfield will take part in two public Inauguration Day panel discussions on Friday, January 20, 2017. Democracy and Donuts II, will be held at the UIS Public Affairs Center Food Emporium from 4:30 to 6 p.m. 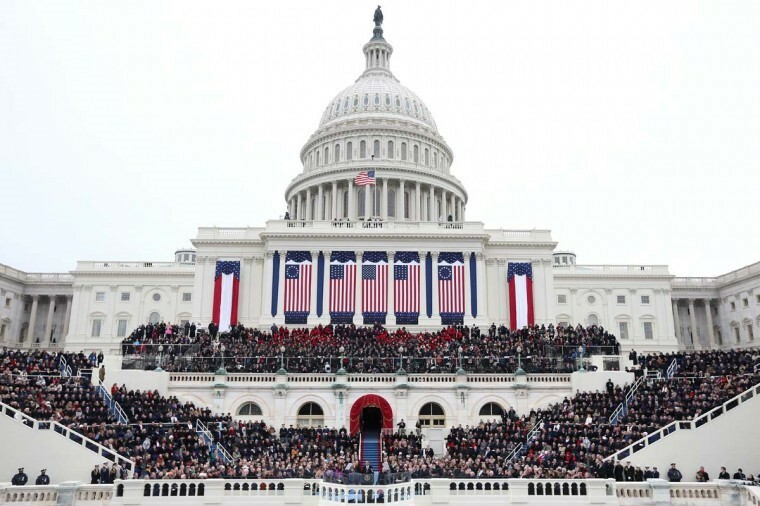 This event is intended to provide an opportunity to reflect on the democratic process with a specific focus on the time period between the election and the inauguration. The event will feature four panelists, each with a different area of expertise in topics related to the impending inauguration. Panelists include Heather Dell, UIS associate professor of women and gender studies; Ali Nizamuddin, UIS associate professor of political science; Jae Sik Ha, UIS assistant professor of communication; and Dalitso Sulamoyo, CEO of the Illinois Association of Community Action Agencies. An Inauguration Day panel discussion hosted by the University of Illinois Springfield and the Springfield Art Association will take place at Innovate Springfield, located at 15 Old State Capitol Plaza in downtown Springfield, starting at 5:30 p.m. The unprecedented events of Election 2016 have shaken longstanding assumptions about American politics and left many people with questions. On Inauguration Day, a panel of scholars will be on hand at Innovate Springfield to answer them. The panel will include Devin Hunter, UIS assistant professor of history; Ken Owen, UIS assistant professor of history; Christian McWhirter, research historian at the Abraham Lincoln Presidential Library and Museum, and Christopher Schnell, consulting historian at the Springfield Art Association. The public is invited to attend this free event. Street parking is available. Influenced by both natural and mediated landscapes, a longing for the wilderness, and failed attempts to conjure personal experiences in the landscape, Lotz’s ceramic sculptures are fragmented and illusive abstractions that can elicit a single place and time or an amalgam of time, experiences, and desires. 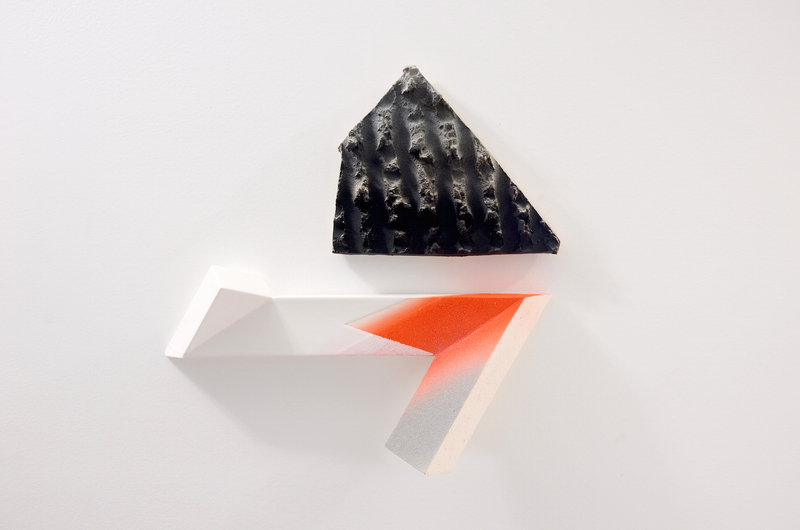 Tyler Lotz’s sculptures and vessels have been shown at venues including the Elmhurst Art Museum – Elmhurst; Illinois, Dubhe Carreño Gallery – Chicago, Illinois; Cervini Haas Gallery/Gallery Materia - Scottsdale, Arizona; Harvey/Meadows Gallery - Aspen, Colorado; Franklin Parrasch Gallery – New York City; The Clay Studio – Philadelphia, Pennsylvania; and SOFA Chicago, Illinois. Lotz’s work has been presented abroad at The First World Ceramic Biennale Korea and 2010 Vallauris Biennale Internationale in Vallauris, France. Having received his BFA from Penn State and his MFA from the New York State College of Ceramics at Alfred University, Lotz is currently a professor teaching at Illinois State University.